Pancreatic resection – a surgery to remove all or part of the pancreas – is frequently performed on patients with cancer. Following the operation, around 30 percent of patients suffer a postoperative fistula . Pancreatic fistula derives from an anastomotic leakage after pancreatic surgery. This can have very severe consequences, as the powerful digestive enzymes produced in the pancreas can enter the abdominal cavity and begin digesting other organs. Pre- and post-operation patients are often subjected to dietary restrictions; their nutritional requirements are supplied intravenously to circumvent the physiological digestive route. This minimizes the risk of pancreatic fistula by reducing the amount of enzyme produced – but also has a significant negative impact on the patient’s quality of life because the process usually last for at least three weeks. The challenge lies in the fact that the pancreas is extremely difficult to seal. 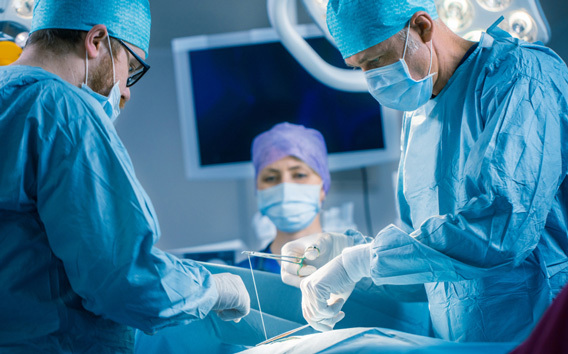 It’s made of soft tissue, which means traditional fastening methods like stitches or staples can’t stop the flow of pancreatic fluid effectively. To meet this high unmet medical need, our researchers at Adhesys Medical are working on a new innovative adhesive that could potentially seal the pancreas more effectively, help prevent postoperative fistula and thereby empower patients to focus on their recovery after pancreas resection. In general, our surgical glue that’s designed for use inside the body is called VIVO: It’s our patented fully synthetic biodegradable adhesive. The VIVO technology is based on polyurethanes, with elastic property that seals the wound with a strong bond. The potential impact that our new special derivative of VIVO for the pancreatic surgery could have for patients is already receiving high-profile recognition: The German Federal Ministry of Education and Research is financially supporting our efforts to find innovative solutions for the high unmet medical need in pancreas surgery (KMU-innovativ: Medizintechnik, contract number 13GW0108A). The newly developed VIVO glue for the pancreas surgery is now being tested in pre-clinical trials in partnership with the Faculty of Medicine at Aachen University Hospital, executed by the Institute for Animal Science under the direction of Univ.-Prof. Dr. med. Rene H. Tolba and the Clinic for General, Visceral and Transplantation Surgery under the direction of Prof. Dr. med. Uwe Klinge. The first in vitro tests have shown that the material is highly resistant against pancreatic fluid. If the pancreatic VIVO glue passes all phases of testing, it could potentially allow patients to leave hospital sooner and avoid follow-up operations – reducing treatment costs, cutting the burden on the healthcare system, and enabling patients to focus on their recovery.